Coach Hillary, Coach Johnson, Lawson Reel, D’Andre Ryans, Chad Gilchrist. 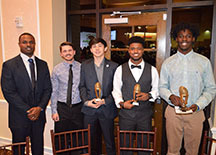 The annual Augusta Chronicle/Augusta Sports Council All Area Football Banquet was held January 14th at The Legends Club in Augusta. Strom Thurmond Head Football Coach Hillary and Assistant Coach Johnson attended with their All Area Players Lawson Reel, DeAndre Ryan and Chad Gilchrist. All three of the Thurmond athletes were recognized for their outstanding performance on the gridiron during the 2015 season. 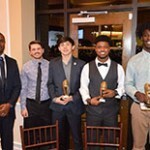 Attending the banquet were legendary NFL punter Ray Guy, Super Bowl Champion player Deon Grant and two-time Ray Guy Award winner Tom Hackett from the University of Utah. 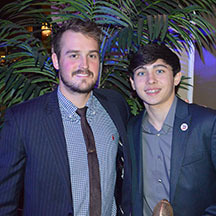 Lawson Reel racked up five field goals and forty-nine extra points for the Rebels during the 2015 season. He also averaged 33.8 yards per punt and finished in the top three for Punter of the Year. DeAndre Ryan had fifty-two receptions for 756 yards and seven touchdowns. He also had two interceptions during the 2015 season. Chad Gilchrist rushed for 1,274 yards and 11 touchdowns on the offensive side of the ball and executed 8 quarterback sacks on the defensive side. Also selected from Strom Thurmond High but not in attendance was Malik Nicholson who recorded six interception in 2015.